Grades 9-12 In order to ensure that all of our students are well-prepared for the rigors of college and are receiving the best education available, we require each of our high school students to engage in the study of four literature classics each year. The term "classic" often implies age or antiquity, but also means the material is somehow valuable in shaping what comes in later time periods. When traditional literary scholars refer to classic literature, they usually mean this literature is widely acknowledged as having outstanding or enduring qualities. The classical literature list for Bridgeway students was compiled by The National Endowment of the Humanities, who queried top public and private schools from across the nation, at least one in each state. Views expressed in the books on the list do not necessarily reflect those of Bridgeway Academy. Therefore, we suggest that parents review a synopsis of each chosen classic to determine what is appropriate for their student. Students must submit one classic literature report per quarter, for a total of four reports per school year. 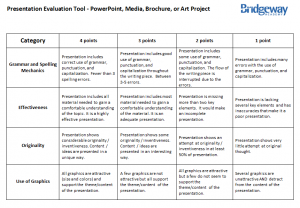 One report must be in the form of a multi-media presentation. A variety of report methods can be found in the Literature Classics course listed in your student's Bridgeway Moodle account. A basic high school report guide is also provided below. Report length must be 700 words minimum. If typed, the font should be 11-12 point Times New Roman. Your introduction should include the author and title of the book. Generally, a strong introduction begins broad and moves to a specific thesis statement. Your introduction should set the tone for, and offer some insight into, your paper. This will vary based on the type of book on which you are reporting. For a biography, share the major incidents in the subject’s life and discuss how they shaped or impacted his or her life. For a non-fiction book, provide an overview of the author’s presentation of the main subject in the book and compare or contrast your own ideas regarding that subject. For a fiction book, select one of the following options: 1) Identify the most important theme of the book and provide an analysis of that theme; 2) Describe how the setting contributed to the overall mood, feeling, lesson, or theme of the book; 3) Complete a character analysis (Visit the Classic Literature Report course in Bridgeway Moodle for a character analysis template. ); 4) Compare the conflict and resolution of this book to one you have read in the past (This may include external conflicts, such as an outside force, or internal conflict, such as a struggle that the characters experience within themselves.). Remember to discuss each topic introduced in your thesis sentence in a separate paragraph. Discuss your personal thoughts about the book, whether they are positive or negative. Include both views for further interest. For a fiction book, include your views of how any conflicts in the plot were resolved. Discuss how the book influenced your thinking, goals in life, etc. Use examples from the book to support your statements. Do you agree or disagree with the author’s perspective or presupposition? Discuss. Do you recommend this work? Why or why not? Your conclusion should leave the reader with some type of parting word. Tie everything together and put it in perspective for the reader. Project should contain a minimum of 15 slides. All rules of grammar and spelling apply. Slides must contain only complete sentences. Identify the most important theme of the book and provide an analysis of that theme. Describe how the setting contributed to the overall mood, feeling, lesson, or theme of the book. Complete a character analysis (Visit the Classic Literature Report course in Bridgeway Moodle for a character analysis template.). Compare the conflict and resolution of this book to one you have read in the past (This may include external conflicts, such as an outside force, or internal conflict, such as a struggle that the characters experience within themselves.). Slides must include a conclusion that discusses whether the student would recommend the piece of literature. Slides should contain a clear introduction, body, and conclusion, mirroring an essay. See the above explanation of Report requirements. Slides should contain no less than 10 images related to the text, author, etc. All sources of information outside of the student and classic text must be cited using MLA style. The student should display a variety of slide organization styles, colors, etc., within the presentation. The presentation should be visually appealing. A style template should be used and be consistent throughout the project. 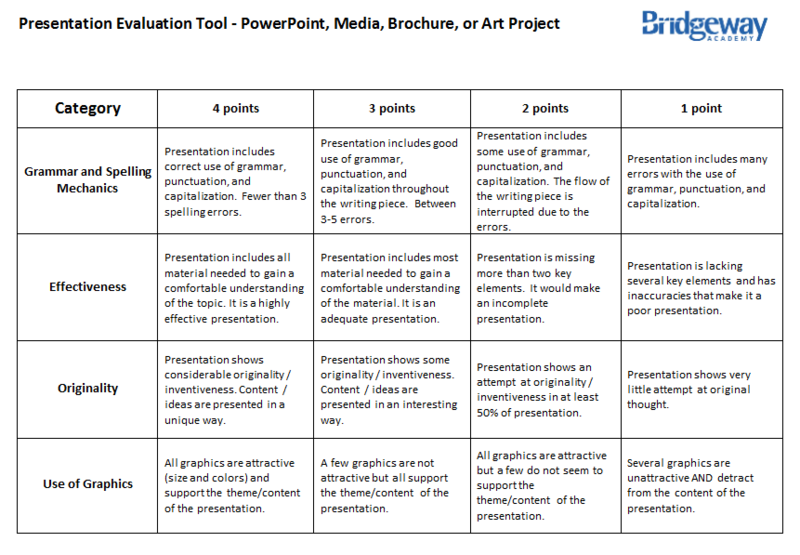 Templates can be downloaded from www.microsoft.com for PPT presentations. Slides should be well-organized and include graphics, sound, and transitions. A list of high school books is available in the Literature Classics Report course in your student's Bridgeway Moodle account. Grades 1-8 As part of your student's language arts course, they are required to write one classical literature book report per quarter, for a total of four book reports per school year. One of the two reports per semester can be completed in the form of a special project. You will find a list of these special projects at http://www.teachnet.com/lesson/langarts/reading/bookrepts1.html. Choose from List One, List Two, or List Three. Note: List Two contains items that may be easier for younger students. 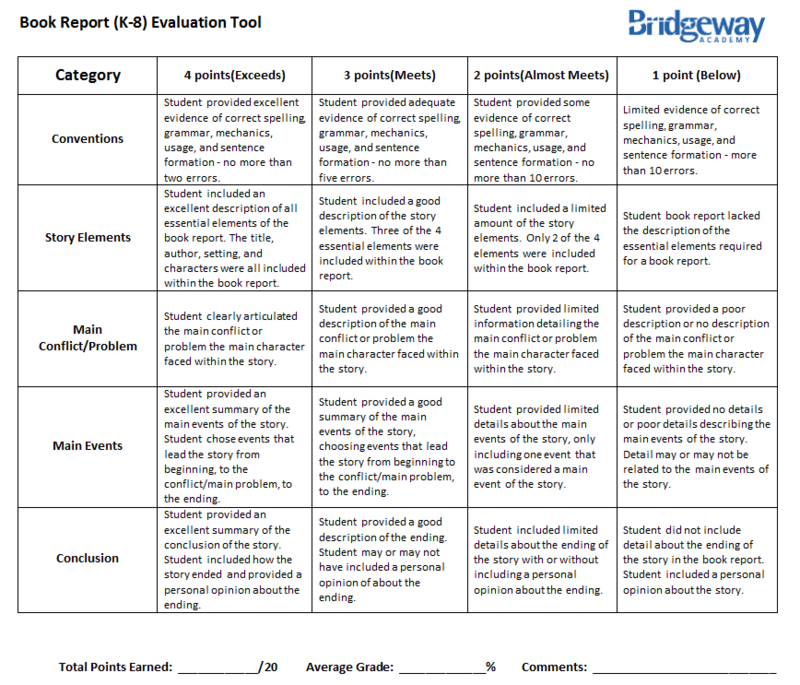 Book reports must be graded and submitted to Bridgeway at the end of each semester. Book report grading rubrics are located below and can also be found in the Book Report course listed in your student's Bridgeway Moodle account. Special projects may be scanned or photographed and submitted through the Bridgeway Learning Center. For more information on uploading book reports, review "Submitting Materials to Bridgeway," in the Knowledge Base. Book report lists are located on the Bridgeway Moodle site in the Book Report course. Your advisor can help you locate this information if you need assistance. 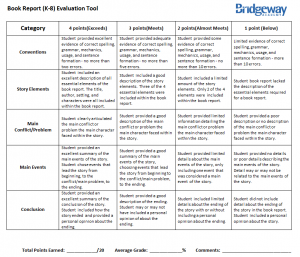 Book Report Grading Rubrics The following rubrics can be used for grading written book reports. To determine a student’s letter grade, add up the total points received in each area of the rubric and divide by the total possible points in the rubric. In the rubric above, the total possible points is 4 x 5 = 20. These rubrics and others resources are available in the Literature Classics Book Report course in your student's Bridgeway Moodle account, as well as in the Resources link located on the front page of your student's Moodle account.